Our Abpromise guarantee covers the use of ab150115 in the following tested applications. ab176103 - Mouse monoclonal IgG1 (Alexa Fluor® 647), is suitable for use as an isotype control to complement this secondary antibody. ICC/IF image of ab7291 stained HeLa cells. The cells were 4% paraformaldehyde fixed (10 min), permeabilized with 0.1% Triton X-100 for 5 minutes and then incubated in 1% BSA / 10% normal donkey serum / 0.3M glycine in 0.1% PBS-Tween for 1h to block non-specific protein-protein interactions. The cells were then incubated with the primary antibody (ab7291, 5µg/ml) overnight at +4°C. The secondary antibody (red) was ab150115 Alexa Fluor® 647 goat anti-mouse IgG (H+L) used at 1µg/ml for 1h.DAPI was used to stain the cell nuclei (blue) at a concentration of 1.43µM. Overlay histogram showing Jurkat cells stained with ab8090 (red line). The cells were fixed with 4% paraformaldehyde (10 min) and then permeabilized with 0.1% PBS-Tween for 20 min. The cells were then incubated in 1x PBS / 10% normal goat serum / 0.3M glycine to block non-specific protein-protein interactions followed by the antibody (ab8090, 0.1μg/1x106 cells) for 30 min at 22°C. 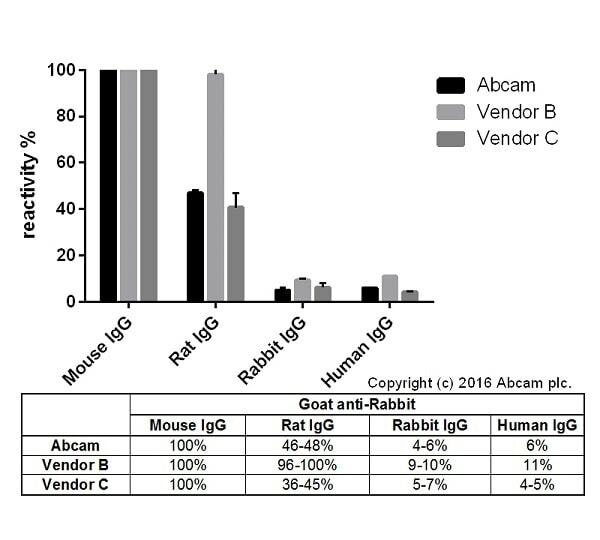 The secondary antibody Goat anti-mouse IgG H&L (Alexa Fluor® 647) (ab150115) was used at 1/2000 dilution for 30 min at 22°C. 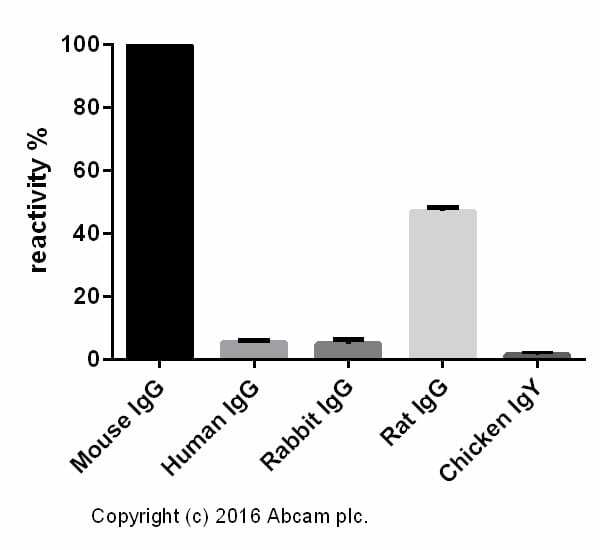 Isotype control antibody (black line) was mouse IgG2a [ICIGG2A] (ab91361, 0.1μg/1x106 cells) used under the same conditions. Unlabelled sample (blue line) was also used as a control. Acquisition of >5,000 events were collected using a solid-state 25mW red diode laser (635nm) and 675/30 bandpass filter. The cells were 100% methanol fixed (5 min) and then incubated in 1% BSA / 10% normal goat serum / 0.3M glycine in 0.1% PBS-Tween for 1h to permeabilise the cells and block non-specific protein-protein interactions. The cells were then incubated with the antibody (ab7291, 1µg/ml) and (ab16048, 1µg/ml) overnight at +4°C. The secondary antibodies were ab150115 Alexa Fluor® 647 (red) goat anti-mouse IgG (H+L) used at 2µg/ml for 1h and ab150077 Alexa Fluor® 488 (green) goat anti-rabbit IgG (H+L) used at 2µg/ml for 1h. DAPI was used to stain the cell nuclei. Publishing research using ab150115? Please let us know so that we can cite the reference in this datasheet. HeLa cells were cultured on cover slips and fixed with 4% paraformaldehyde in PBS (pH7.4) at room temperature for 10 min after exposed upon 10 uM choloroquine for 6 h. After washing three times with PBS, the cells were permeabilized with ice-cold methanol for 2.5 min. After three washes with PBS, the cells were incubated with blocking solution (5% BSA in PBS) for 1 h and then with primary antibody p62 overnight at 4ºC. 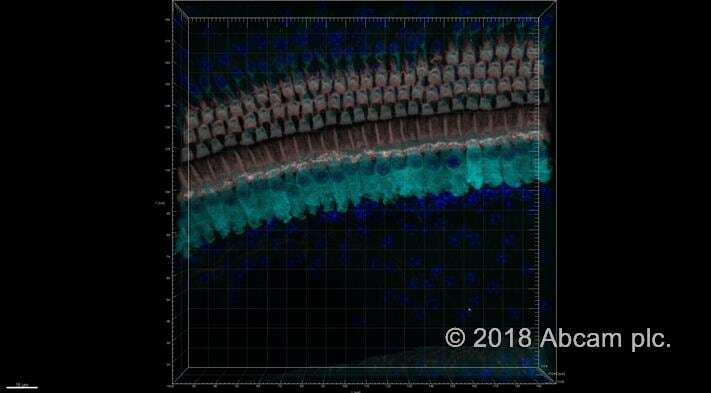 The next day, the cells were washed five times for 5 min each time with PBS and then incubated with secondary antibody Goat Anti-Rabbit IgG H&L (Alexa Fluor 647) for 1 to 2 h. The cells were washed four times with PBS for 5 min each time, and DAPI stained for 15 min. After three washes with PBS, the coverslips were mounted on slides using Fluoro-GEL (Electron Microscopy Sciences). Images were taken using Keyence BZ-X700. Stained fixed sensory epithelia from p15 mice with M-anti-myosin7a overnight in 4 c, and then incubated the tissue for 2 hours in room temp with Abcam's goat anti mouse secondary 647 antibody (ab150115), as well as DAPI. 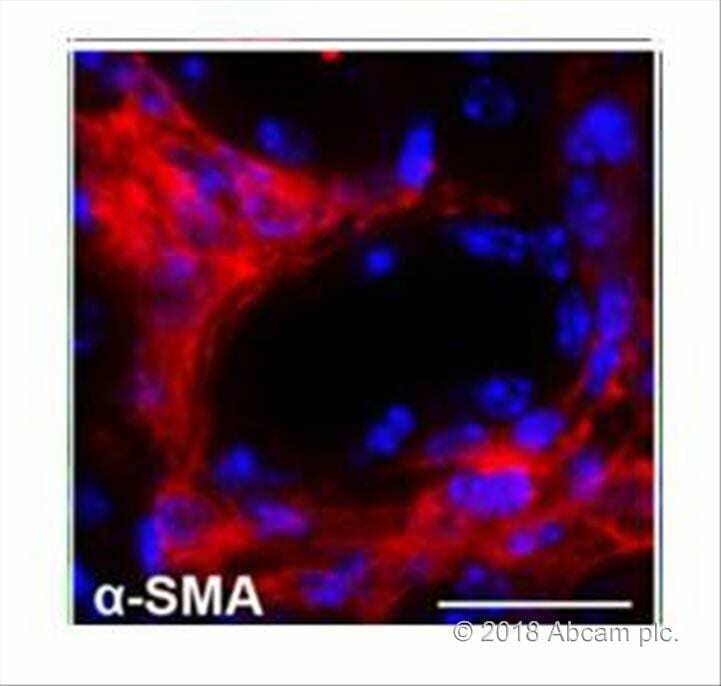 ab150115 Goat Anti-Mouse IgG H&L (Alexa Fluor® 647) used with anti-GFP antibody ab38689. Cryostat sections of E10.5 mouse embryo, which were fixed with PFA before gelatin/sucrose embedding. Antigen retrieval is optional in this staining. Blocking used was protein block. The left image is abcam's anti-GFP [6AT316] antibody (ab38689) used 1:200, for 12h at RT, with a competitors secondary antibody. On the right, is the same primary antibody, but this time used with abcam's Goat anti-Mouse IgG H&L (Alexa Fluor® 647) (ab150115) at 1:1000 dilution, for 3h at RT. thank you for your mail, I chose ab76055. could you please confirm that the following secondary antibody AB 150115 is suitable for the antibody I'd like to buy? I can confirm, that the Goat polyclonal Secondary Antibody to Mouse IgG - H&L (Alexa Fluor® 647) (ab150115) would be suitable for detection of the Anti-E Cadherin antibody [M168] (ab76055). The ab150115 is covered by our six month guarantee for ICC/IF, ELISA, IHC-P and Flow Cyt applications.